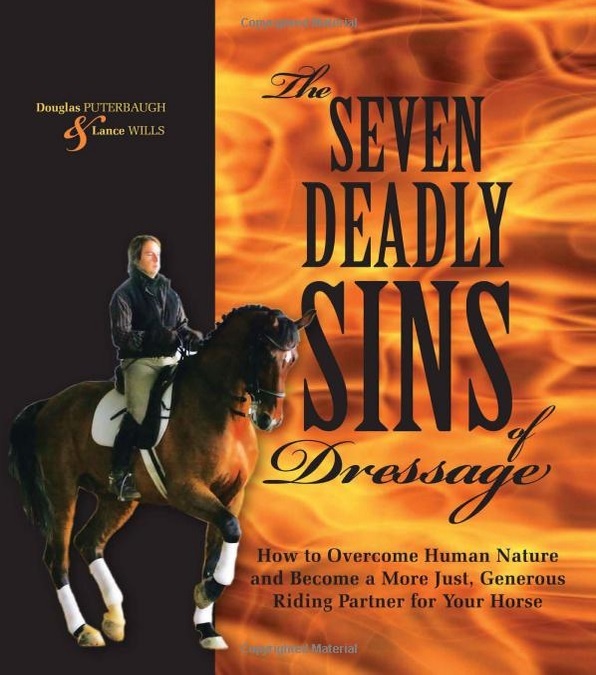 advantages, because knowledge is power"
For my birthday, my wonderfully thoughtful sister Abbie gave me a new book: The Seven Deadly Sins of Dressage, by Douglas Puterbaugh. I’ve written reading notes for the first two sins, Ignorance and Timidity, and now it’s time for the third! Puterbaugh declares that pride has no advantages. Though you (me!) may think that it can be good to feel pride, Puterbaugh believes that it will always, always detract. I’m not sure if I 100% agree with his assertion, but that’s the context for his chapter. In what ways am I guilty of pride? I took very few notes for this chapter. Though I am a proud person outside of equestrianism, I learned the hard way in high school that it’s not a good way to present oneself. Consequently, I’m constantly checking myself to make sure I’m modest. And of course, I find it impossible to maintain any pride around Robbye. She is the ultimate humbler. Plus, journaling, especially in a public space, requires oodles of introspection; Puterbaugh defines pride as a lack thereof. It’s hard to be proud with a partner who provides constant reminders of my ignorance and with a hobby which requires constant self-analyzing. Punishing your horse without first considering that you might have made a mistake is an act of pride…The best riders are not so quick to blame the horse. Rather, they first question the clarity of their aids. I try to remain vigilant regarding my aids, and I certainly am conscious of my own ignorance, but it’s hard not to get frustrated when I feel like I’m asking perfectly and I’m still not getting the response I want. I need to try harder to look at first myself, and then Robbye. How can I fix my pride? Puterbaugh recommends overcoming pride by using our reason: “Realize that dressage is difficult, and that all riders struggle on the long journey to become proficient”. Realize that everyone learns from someone; even the great stars and best teachers owe debt to other stars and teachers. If geniuses need help and develop only slowly over time then what does that say about the rest of us? Dressage is a discipline that gives up its secrets only grudgingly. They have to be earned through grit and determination. Nothing of value comes easily. What else did I learn about pride? Overall, I seemed to learn very little in this chapter. I hope that’s because I’m humble and sensitive to my own pride – and constantly working on it, since I know it’s a vice that I already have – and not because I’m too proud to recognize it. “Punishing your horse without first considering that you might have made a mistake is an act of pride…The best riders are not so quick to blame the horse. Rather, they first question the clarity of their aids.” 1000% agree with this. Maybe 1million%. It really really bothers me when people immediately blame the horse, when it’s rider error almost always. Hmm that’s interesting about that it will always detract. I like to think that I am a pretty modest person but I do feel pride when all my hard work pays off. I wonder why that’s a bad thing? that said tho, pride IS something i struggle with, esp as it occasionally makes me turn a deaf ear to good advice.